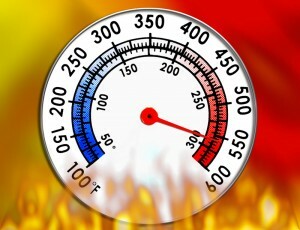 Thermistors serve a crucial role in temperature detection. For example, thermistor temperature detection can be used in fire alarms to detect fires based on a sudden change in temperature. Unlike photoelectric detectors or ionization alarms, thermistors only require heat to activate. Thermistors are temperature-sensing elements made of semiconductor material that displays large changes in resistance in proportion to small changes in temperature. The photoelectric detector requires heavy smoke or a smoldering fire to work properly. Heavy smoke from a fire enters a chamber in the alarm with a LED light. 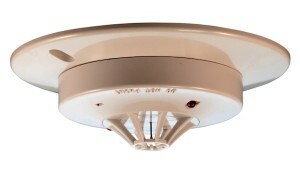 The smoke will then deflect light onto a photoelectric sensor, activating the alarm. The complex circuitry and required chamber increases manufacturing price. Although the ionization method in a fire alarm is effective in alerting those around it in the case of hot blazing fires, it is also sensitive to dust or steam which causes false alarms. units will either be disabled or removed completely by annoyed owners due to so many false alarms.The disabling and removal of the fire alarms increases the risk of bodily harm. The radioactive nature of ionization alarms requires proper disposal when the alarms are no longer working. Just like photoelectric detectors, the circuitry in an alarm utilizing the ionization method requires complex circuitry, making this alarm costly. The most cost effective fire alarm is one utilizing the thermistor method. The thermistor method, unlike the previous examples, uses heat detection to activate. The alarm activates once the thermistor detects a high temperature. Thermistor temperature detection doesn’t require smoke to activate and has fewer false alarms. The thermistor uses the ambient temperature of a building and will only activate when that temperature increases exponentially. The thermistor method is reliable in this fire alarm example as there would be few false alarms and a quicker alert rate, but the thermistor method is also versatile. An alternate circuit to measure temperature with a thermistor is by using a Wheatstone Bridge. With strategic placing, the thermistor method would not cause unnecessary alarms, while still being reliable in the industrial workplace to ensure all employees reach safety when a threat of fire occurs. Thermistors can activate at specific temperatures. The fine tuning allows for even greater versatility in their placement. Data compiled and published by www.usfa.fema.gov show the numbers on residential fires and their causes from 2009 to 2011. The connections behind outlets in the wall cause about nine percent of all residential fires. Although not a high number comparatively, it is another place a thermistor temperature detection type fire alarm would prove beneficial. The thermistor used for temperature detection is so tiny that an alarm could be manufactured small enough to be placed behind electrical outlets. Should a high temperature occur in the outlet creating a fire danger, the alarm would alert those around to shut the power off or could shut off power automatically. Production of a fire alarm utilizing the thermistor temperature detection method is more cost effective because of the simple circuitry and easy construction. The alarms require one part for manufacturing, rather than multiple complex parts. The thermistor doesn’t contain hazardous material, allowing for easy disposal when the alarm is no longer working. Thermistors used in temperature detection are versatile and cost effective pieces of circuitry. In our example of fire alarms, we have seen that they are more cost effective due to simple circuitry, have fewer false alarms due to their effective detection of temperature and are versatile due to their small size. These thermistors are crucial for temperature detection, not just in fire alarms, but in any piece of machinery that requires temperature detection. 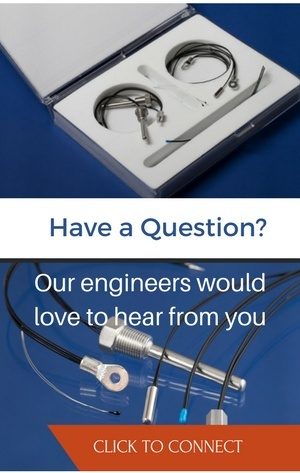 Although there are multiple types of temperature sensors that can be used for this application, a thermistor is extremely responsive and accurate. Voltage is constantly flowing through the buzzer and the thermistor. When the thermistor gets hot, as it would during a fire, the resistance drops allowing the positive voltage to pass through the thermistor, diode and the (#2) 1k resistor. 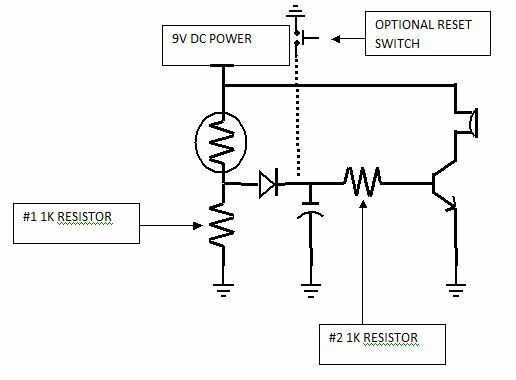 The 1k resistor regulates the voltage to the transistor to ensure proper function. The transistor connects the ground to the buzzer and is required to complete the circuit. Once the positive voltage flows through the transistor, it “switches” on allowing the buzzer to sound. On standby, the (#1) 1k resistor grounds the capacitor and base of the transistor so the buzzer remains off when there isn’t the danger of fire. The capacitor is used for electrical “noise” and the function to keep the alarm on once turned on. When the capacitor becomes charged it will provide voltage to keep the transistor on. To reset the alarm with the optional reset, the switch discharges the capacitor which turns off the transistor, turning the buzzer off. The circuit/buzzer activates when the thermistor reaches 8.7k ohms. The temperature the thermistor needs to reach for 8.7k ohms is 87°c or 188.6°f. Thermistors with different beta and resistance can be used to fine tune the 8.7k ohms temperature activation point on the circuit. This entry was posted in Thermistor. Bookmark the permalink.